Specializing in vessels that are bargain priced: unfinished boats, damaged yachts, miltary surplus, fixer-uppers, older wooden boats and often times well maintained vessels. We market donated vessels, no longer needed by non-profit organizations as well as estate sales and reposessions. 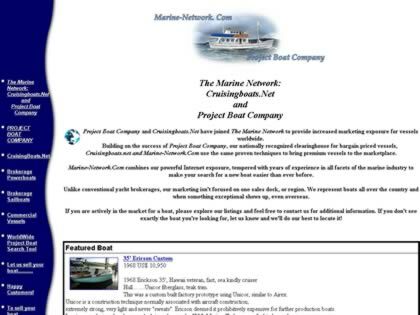 Web Site Snapshot: If available, above is a snapshot of the Project Boat Company web site at http://www.projectboatco.com/ as it appeared when this site was added to the directory or last verified. Please Note that Boat Design Net has no involvement with the above web site; all content and images depicted in the above thumbnail are the property and copyright of Project Boat Company unless otherwise noted on that site. Description: Specializing in vessels that are bargain priced: unfinished boats, damaged yachts, miltary surplus, fixer-uppers, older wooden boats and often times well maintained vessels. We market donated vessels, no longer needed by non-profit organizations as well as estate sales and reposessions.